Visit each of the blogs listed below (it’s always nice to leave a comment) and look for participating Treasure Hunt players – they will have the picture of the SU! Box and they will list their clue. Make a note of what the clue is and whose blog it is on. When you have collected 50 clues* email them to ME at stampbyrhonda@gmail.com listing each clue & where you found it. *There may not be 50 clues when the blog hop starts, but others will be joining in as we progress toward the end on October 25th. I will be posting, on my blog, when new participants have joined. Please follow my blog so you won’t miss out on any late entries. I am offering a drawing for a free NIP RETIRED stamp set of my choice for anyone in the US who becomes a follower of my blog. Due to Stampin' Up! rules I can not offer products to those of you in other countries. I have thought about that rule a bit and have decided to amend my drawing. I will still offer the stamp set to the US winner of my drawing, but I will add something just in case the winner is from a different country. I will offer a very special hand crafted gift. If the prize winner is from the US, you can opt to receive the set or the hand crafted gift. In addition to the follower prize, I will also make two additional very special hand crafted gifts. One will go to someone who leaves a comment and one will go to one of my viewers who visits my Stampin' Up! website and fills out their contact information My Stampin' Up! 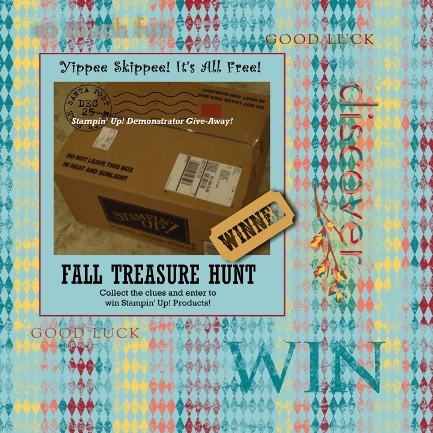 http://www.stampinup.net/esuite/home/rhondaprice/ My drawing will take place on October 26th. This is the perfect tool to hold your Framelits in place when you run them through the Big Shot. Need this!!! Thanks for the Hunt clue! I was lucky and ordered the magnetic platform before they went on back order. I love it. I'm following your blog now. You have some gorgeous cards on your blog! Thanks for sharing. I need this, too! Fun blog hop, thanks! I love my magnetic platform. I have subscribed to your blog. Thanks for a chance to win your blog candy! I am looking forward to getting this platform someday... Just waiting until they are available for ordering again! :) I am a follower of your blog via Feedly. So happy you decided to play along with the LNS Fall Treasure Hunt Blog Hop Rhonda. Awesome! I just received my Magnetic Platform and now I don't think I can live without it. It's simply marvellous. So is your blog! PS I live in the states part time, so hope I qualify for one of your draws! so glad you keep reminding viewers to play along. it's working! The Magnetic Platform is on my wishlist! Thanks for the fun hop. I just E-mailed my list to you. Thanks for being on the Treasure Hunt team, Rhonda, and thumbs up to you for keeping your blog list up to date! The Magnetic Platform is now on my must-have list although at first I thought I could live without it (and spend that money on other SU! stuff) - but then I did a couple of projects with framelits that took way longer than they should just because of the time I spent getting the framelits and edgelits to be positioned on my slightly warped cutting pads. The Magnetic Pad is awesome!